Survivors of an acute stroke who are transferred to a PALTC facility need a multidisciplinary assessment and treatment plan that lowers risk for post-stroke complications, helps to optimize physical and cognitive function, and reduces the risk of stroke recurrence. 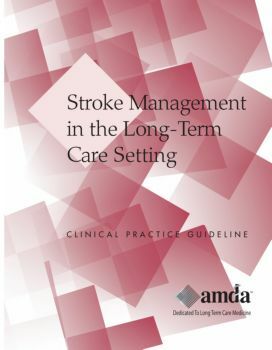 This CPG will help the facility care team individualize its approach to stroke evaluation, treatment, and prevention and reach shared decisions about care that consider the patient's physical and cognitive status, prognosis, goals of therapy. It includes an assessment of the benefits, burdens, and alternatives to evaluations, tests, and treatments. Caregiving staff will learn how to respond and with whom to communicate when they recognize the signs and symptoms that may signal an acute stroke or stroke complications. The steps in this guideline are relevant in the context of those categories. These differences are reflected in the text by the use of color-coded labels.